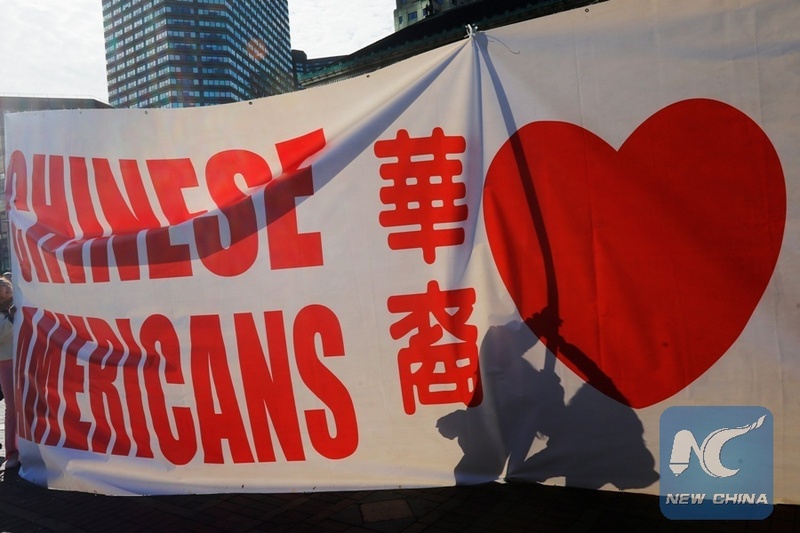 BOSTON, the United States, Oct. 14 (Xinhua) -- Hundreds of Asian Americans on Sunday afternoon held demonstrations in central Boston to show support for a lawsuit accusing Harvard University of discriminating against Asian American applicants by using "de facto racial quotas, racial stereotypes and higher standards." Harvard has denied the charges. The lawsuit, launched by the Students for Fair Admissions (SFFA), an anti-Affirmative Action advocacy group, will go to trial on Monday at a U.S. District Court in Boston. Before the crowd at the Copley Square, leaders and representatives of Asian-American communities across the United States took to the stage and made speeches one by one, arguing that the racial factor should not play a role in selective college admissions. Equal education rights for all is an Asian American dream, they said. Many demonstrators held slogans and banners on which the following is written: "My race should not hurt me in admissions" or "Discrimination in the name of diversity is wrong." "For many years Asian Americans have been under the impression that Harvard and other elite universities treat them differently than they do white, African American and Hispanic applicants. So this lawsuit is about ending Harvard's discriminatory practices that are targeting Asian Americans." SFFA President Edward Blum said in an interview with Xinhua. The final goal of the lawsuit is to have Harvard stop discriminating against Asian Americans and treat everyone, whites, African Americans, Hispanics and Asian Americans the same during the admissions process. Yes, Not to use race in their admissions policies." said Blum, "Harvard can achieve diversity without discriminating." "Over the decades, reputable journalists, scholars, discriminated-against students and former admissions officers have revealed that Harvard and other selective colleges unlawfully use de facto racial quotas, racial stereotypes, and higher standards to discriminate against Asian-American applicants", the rally organizers accused in their press release for the rally. Though Asian American applicants are exceedingly competitiveness on all objective measures both in academic and extracurricular criteria, they are consistently rated the lowest by the college's personality trait ratings, said Yukong Zhao, co-founder and president of the group Asian American Coalition for Education, a major organizer of the rally. Harvard's race-based admissions model creates unbearable study burdens, stress, depression and many other serious psychological issues among Asian-American children, Zhao told Xinhua, noting it's also an insulting to Asian Americans who are among the best in terms of entrepreneurship, technological innovation and so on. The U.S. Justice Department announced last month it was supporting the lawsuit, saying Harvard's admissions process "may be infected with racial bias." However, the dispute over the lawsuit appears to be big and hot. It's widely expected that the case will finally go to the Supreme Court. "I support affirmative action...I think that the premise that Chinese Americans are negatively affected by affirmative action is incorrect." Sally Chen. a senior Chinese American student studying history and literature at Harvard, told Xinhua. "I do think Asian Americans do face discrimination in this country... but I don't think that this supreme court case, which is just generally trying to get rid of race as a part of our admission process, will address that issue in any way." said Chen, adding that she would support Harvard revise its current policies addressing implicit bias in the admission process. Larry Bacow, Harvard's new president, defended the school's race-conscious admissions process last month. "People understand and recognize that we learn from our differences - that creating a diverse learning environment enriches the learning experience for every student on campus," local media quoted Bacow as speaking at a higher education event in Detroit. Asian-Americans now account for 23 percent of all admitted students in Harvard, according to local reports. U.S. District Court Judge Allison Burroughs, who was nominated by then Democratic President Barack Obama and seated in 2015, will preside over the upcoming trial, which is expected to last two to three weeks.